There’s something deeply troubling about this Answer because it leads to the conclusion that market-based housing production doesn’t matter much and public subsidies alone are what we need to solve our housing problems. Like it or not, the vast majority of low-income people in the U.S. do not receive rent subsidies or live in subsidized housing developments. That was the case even when federal spending on affordable housing was at its peak. Most people with housing affordability problems are forced to cope in the private, unsubsidized housing market. When rents are high because of policies that artificially limit housing supply, poor people pay those inflated marginal rents along with everyone else – in fact, they pay a disproportionate share of that extra cost as a percentage of their income. The Answer glosses over many important public policy issues that should be part of any progressive housing agenda. High land prices are often a symptom of unreasonable land use regulations, not an immovable obstacle. “Desirable locations” are typically walled off by restrictions on density and, in many suburbs, by prohibitions on multifamily housing. Labor and construction practices are not a fixed cost but a policy variable that results in dramatic cost variations from place to place and from project to project. There is no question that people at the bottom of the income scale need financial support to obtain housing at a reasonable cost. Even an unfettered private housing market (if such a thing existed) could not produce housing affordable to people working at minimum wage. But it’s largely because of misguided public policy that the private sector is prevented from building unsubsidized housing for households at, say, 60, 70 or 80 percent of median income – housing for which people are willing and able to pay. We need to tackle income inequity without getting sidetracked by the notion that only public subsidies can produce affordable housing. Thanks for you comments. I agree that subsidies are not the only answer—note that regulation and speculation are both things mentioned as obstacles, and both of those things should be and can be addressed with public policy that is not subsidized housing. If you are suggesting that a completely unfettered market would generate quality affordable housing for every income, with no subsidy or other incentive, even in a place like Manhattan, I think I would disagree. But in some cases would removing obstacles to market forces actually help? Probably yes. I would say neither the market we have now nor a totally “free” market is ideal—and some solutions could be categorized as making markets more free and some as less. Also, this was certainly not intended to be a progressive housing policy summary. 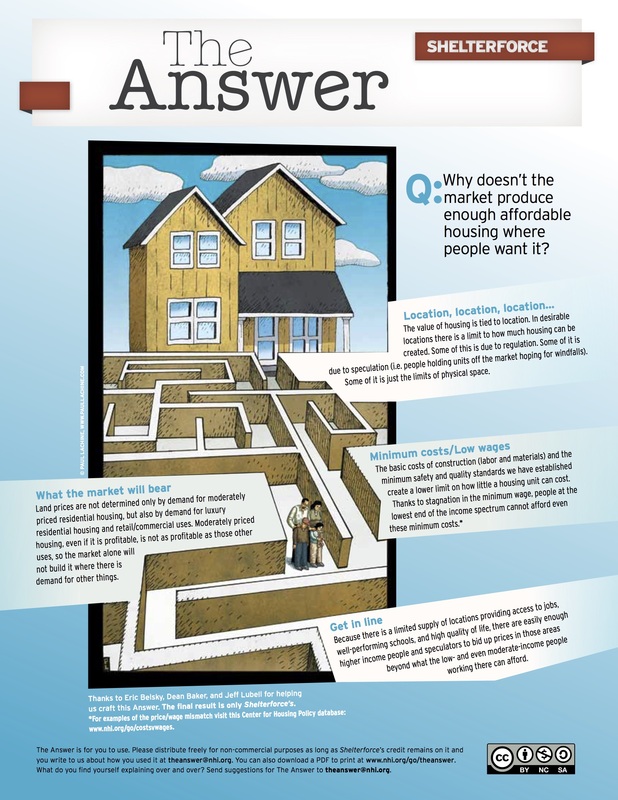 The Answer tries to answer specific questions that people receive in their working lives, and in this case a reader wanted help to explain why we can’t just rely on the market—explaining what we should do is a lot more than a one pager!